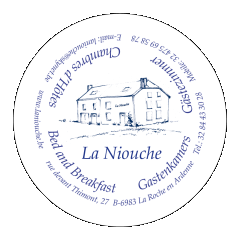 La Niouche is located near La Roche on a high Ardennes plateau. It is a unique, practical and comfortable place, to organize small meetings of ten people. An adequate environment encourages the development, change and evolution. La Niouche is therefore perfect to organise such meetings as ‘brainstorming‘, ‘Top Management‘, ‘Product Presentation‘, etc. At La Niouche, discretion is guaranteed - you are guaranteed to be alone. We prepare your meals, paying attention to details and flavors and using fresh products and Ardennes specialties. At your request, we also offer food and drink of choice for a special occasion - such as a glass of champagne to celebrate the conclusion of a contract or agreement. We have a basic infrastructure for the work sessions, with all the necessary equipment (flipchart, projector, Wi-Fi, etc.). After your meetings, La Niouche can also organize leisure activities: tours, walks, sports or entertainment.